There are also messages sent directly to your little one, like the one you see in the picture above. And again with those colors!! I love the look of the book, it's very child-friendly and sparks the imagination in an instant as soon as you start turning pages. You can learn more about this Valentine's Gift Set by visiting the I See Me! website where there's still time to get one of your very own! You can also follow them on Facebook and/or Twitter. Personalized book make such great gifts. Birthdays and showers especially. My grandson would love this...he is sticker crazy!! Awesome!! Stickers! They're always a hit with both of my kids, but mostly lmy daughter. This is awesome. I love doing Valentine's Day as a mom. It's neat that they can personalize books like that these days. What cute books. These would make great gifts. So cute! Stickers are always fun for Valentine's Day. Kids love personalized books. I know my great granddaughter loves them. How neat!!! The personalized stickers are my favorite part. My son would absolutely adore this. What a sweet book to give at Valentines. I think books make great gifts at anytime. Kids are so fascinated with stickers! It's adorable. This is a nice book to give to them, especially since it has stickers that they'll appreciate. How cute is this book! I love that it's personalized. My kids would think their famous! Love it! Love this! My daughters would go crazy over all the stickers for sure. Thanks for sharing! What a sweet book! I know my daughter would enjoy something personalized like this. Personalized gifts are always the best kind of gift! I love personalized books. My daughter would love this one! This is a fun book for kids. I want this for my kids i want to get one. This is a great gift! Have to look into getting one or some for my granddaughters birthday later on this year. Thanks! These are so cute! I like that their personalized. 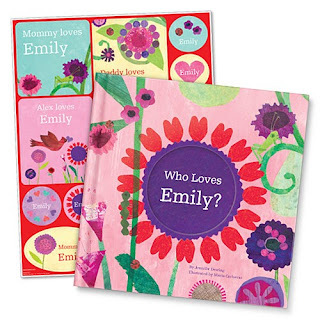 I love these personalized books, so cute! These personalized books are such fun! What a sweet book! Thanks for sharing. I'm always looking for quality books for my kids. I know my little cousin would love to read a book specifically personalized for him. The stickers are such a great addition. This looks and sounds like such awesome book. I know for sure the our girls love to personalize things. A book like this would be a blast at our place. What a sweet book! I love that it is personalized. Stickers are always such a hit too! This would make a great gift. I totally love this kind of books. My son got a book with his name on it and he was so impressed. I love books like this. Sounds interesting and awesome book. What child wouldn't love this! Those personalized stickers wouldn't last very long in our house! What a cute book. The twins are crazy about stickers. They will love this book, for sure. This is so cute! We love stickers in our house. I know the kids would go crazy for this book. How great!!! The stickers are my favorite part. My son would absolutely love this! I am so in love with this idea. It is a precious way to show love! My daughter especially would love a book with her name throughout. Children always live creatibg personalized books. This seems Luke a really nice way to encourage creativity and reading. What a great idea. I love that you can personalize it! That book is so cute! I love that she calls you Grandma Rosey. What an adorable book! I love personalized gifts like this for kids. They are really great to use as teaching tools, too. I know she will love it forever and ever.